This past weekend I had the extreme privilege of flying to Portland Oregon to spend some time with the 2015 Dodge Challenger lineup and while we had an opportunity to drive all of the new models, all of my attention was on the new Challenger SRT Hellcat. With 707 horsepower, this is the most powerful American production car of all time and the 6th most powerful in the global production performance car market so while the chance to drive the entire lineup was on hand – for me it was all about the Hellcat. My time spent driving the 2015 Dodge Challenger SRT Hellcat came in three very exciting phases. First, I spent an hour or so tooling around the streets of Portland before heading to Portland International Raceway, where I experienced the second and third phase of the event – the road course and the drag strip. For the street driving and drag racing portions of the program, Dodge provided me with a Hellcat Challenger equipped with the new heavy duty TorqueFlite 8-speed automatic transmission while the 707hp Challenger intended for road racing use was fitted with a proper 6-speed manual transmission. All of the cars were completely stock right down to the tires. The Sublime Challenger shown here was the exact car that I spent time driving on the street…and it is by far my favorite color combination I have seen on the new Challenger. With our destination being the road course and drag strip of Portland International Raceway, there wasn’t a huge need to push the Challenger SRT Hellcat to the limits on public roads, but with all of that power on hand it is pretty much impossible to NOT let’er rip from a stop here and there. When you do put more than about a quarter throttle to the rear wheels on a normally paved street, the rear tires are simply no match for the 650lb-ft of torque that kicks in very, very quickly. I found that from a stop, simply hammering the throttle will allow this Challenger to lay hundreds of feet of rubber as it happily roasts the tires up through 6th gear. Of course, with some moderation of the right pedal you can hurry away from a stop light quicker than pretty much anything on the street and the same bone crushing power that meets the ground from a stop is present when cruising on the highway as well. There is no point in the Challenger Hellcat’s power band where it feels sluggish in any way, so no matter what speed you are traveling, when you floor the car, it puts you back in the seat and rockets well past any posted speed limit. The Dodge Challenger has often been criticized for its hefty curb weight but that has led to the Challenger offering a smoother, more planted ride than you get with the Ford Mustang or Chevrolet Camaro. The 2015 Challenger hasn’t gotten any lighter so even with the Hellcat set to track mode, it offers a surprisingly smooth ride. Don’t get me wrong, the track suspension mode lets you feel the road as well as any car sold in America, but the ride quality is preserved even in the most aggressive setting – as sports cars go. Also, while the Challenger Hellcat is obviously a 4,400lb car that wont zip through turns like the Alfa Romeo 4C, the chassis, braking and suspension tuning performed on this 707hp beast make it a real blast to drive. It is s still a muscle car, but it is a muscle car that can be thrown into hard corners with a fair amount of confidence. Most impressively from the street drive, I found that when you aren’t mashing the throttle of the Dodge Challenger SRT Hellcat, it is a perfectly calm and comfortable road car. It is fairly loud both at idle and under acceleration, but it doesn’t scream under light throttle (like when you are moving along in traffic). The automatic transmission shifts quickly and smoothly under normal driving situations so while the on-track, high performance shifts will snap your neck in a hurry – the shifts can go relatively unnoticed when you are pushing this beast to the limit. You can feel through the gas pedal that the Hellcat has the instant ability to roast the tires and blast well past 100mph, but it isn’t so extreme that you couldn’t drive it every day without any concerns. It is truly an impressive balance of ultra high performance capabilities and basic drive properties that make it a great road car. After spending some time painting black stripes on the local roads of Portland, I headed back to the raceway to hit the track. First up was a session on the 1.9 mile road course during which I first put 4 laps on the 2015 Challenger SRT 392 followed by 4 laps in the mighty SRT Hellcat. Each round began with a pace lap followed by two high speed laps and then a cool down lap. The first four laps in the SRT 392 car gave me a great chance to get a feel for the track in a car that packs plenty of power. The 392 car was a whole lot of fun to hurdle through the turns and down the straights – but it was nothing like the Hellcat. The Dodge Challenger SRT Hellcat in which I took to the road course had the 6-speed manual transmission and this is truly a transmission built for high performance. The clutch pedal is stiff, pretty much exactly how I would have expected. Some people might complain about the stiffness of the clutch pedal, but I loved how it felt. The gears were easy to find, even when upshifting and downshifting under hard acceleration and hard cornering so in terms of the manual transmission, I don’t see any downside other than the stiff clutch – which, again, I loved. I made my way through the pace lap and as I approached the green flag for my first high speed lap, I cracked the Hellcat wide open and instantly felt the biggest difference between this car and the SRT 392 I had tested a few minutes earlier. The added power of the Hellcat brings you up to serious speeds much more quickly, forcing you to carefully watch your speed as you enter the turns following the two high speed straights. The powerful brake setup has no issue bringing the 4,400lb muscle car down to a stop in a big hurry and even though these cars were hot lapped for some four hours on the track, at no point did I notice any signs of this braking system struggling to keep up. The track suspension and steering setup allows the Challenger to cut through the turns surprisingly well for a car of this size and weight so while it won’t handle like a Viper – it will most certainly allow Hellcat owners to safely push their super muscle car to the limits in more than just a drag racing situation. Even though the Hellcat is a touch heavier than the other models due to the supercharger goodies, this 707 horsepower Challenger is most certainly the best handling of the modern Challengers and I’ve driven them all. Now, I imagine that very few 2015 Dodge Challenger SRT Hellcat owners are going to shell out $60k+ and rush off to the road course, but for a car that has often been criticized for its strict straight line pedigree, the Challenger is more than capable when pushed to its limits on a high speed road course. After the street drive and road course sessions were finished, it was time to unleash the 2015 Dodge Challenger SRT Hellcat on the track where it will likely be the most comfortable – the drag strip. Dodge was quick to boast that the Hellcat powered Challenger is the fastest muscle car of all time, laying down NHRA certified times of 10.8 at 126mph with drag radials and 11.2 at 125mph with the stock tires. Of course, those times were turned in by a driver who had made countless runs in this car on a well prepped drag strip. We, on the other hand, were racing on what I would consider to be a completely unprepped drag strip so we were faced with the challenge of making use of all of that power without the aid of a sticky track surface. The first few guys who took the Challenger SRT Hellcat down the track literally spent the first 200 feet with smoke pouring off of the rear tires – a clear indication that you couldn’t just mash the pedal and go. Honestly, I had figured as much so when it came my time to make a quarter mile pass, I was prepared to put all of my years of drag racing experience to good use and I planned to do so without any of the car’s on-board helpers. I came out just over idle, at roughly quarter throttle and attempted to roll into more throttle in first gear but I eased my right foot when I felt the rear skins begin to slip. As the car slammed into second gear, I again attempted to roll into my throttle but once again, the tires wouldn’t oblige. It wasn’t until the upper RPM range of 2nd gear where I was able to put the pedal to the floor without spinning the tires…but when I did. WOW. This thing roared down the quarter mile and was still pulling very, very hard when I crossed the finish line. My time was 11.8 at 118 miles per hour. This was quite a bit away from the record, but I was happy to get into the 11s on my first try. On my second run, I came out the same but tried to push the issue to get away from the line quicker…causing me to lose traction and back out of the throttle a bit. The result of that early error was a run of 12.5 at 116mph. At the bottom of this review, you will find videos of the Challenger on the drag strip for my 11.8 run. What was even more impressive was that one other journalist, who admittedly had no drag racing experience, was looking to see what he could run if he turned on all of the helpers such as launch control. He made two runs, basically activating launch control and just pushing the gas pedal down, and on both runs he turned in a time of 12.3. That is more than a second off of the NHRA certified time, but it was dead consistent with a driver who was relying on the car to get him safely down the track. I consider back to back 12.3s mighty impressive, as this is a good indication of what someone can expect to run if they just get in the car and go racing, while relying on the high tech helpers. The 2015 Dodge Challenger SRT Hellcat is unquestionably one of the most heavily hyped up cars in the modern era of the American automobile – but this car is deserving of every bit of attention paid to it. It is an incredible muscle car with enough power to outrun pretty much anything that you will come across on the road while also being quicker than almost any street legal car you will see at your local drag strip. Add to those credentials the fact that it can handle the abuse of a road course while leaving a huge smile on the driver’s face AND it can do all of this while being a perfectly comfortable daily driver…and you have yourself a muscle car that should be and will be the vehicle to which all other American performance cars are compared. Other cars might get around the Nürburgring faster than the Hellcat, but in terms of the aspects which make a real difference on the roads of America – the Hellcat is the new King. This is the greatest American muscle car of all time, and it is now the unenviable task of both Ford and General Motors to come up with something that will knock the mighty Dodge Challenger SRT Hellcat off of its throne – which isn’t going to be easy. 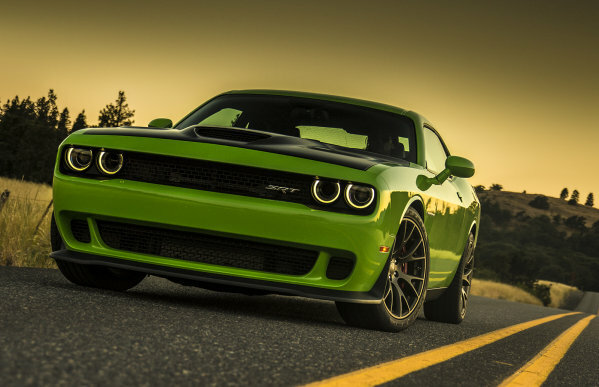 Thanks for the comprehensive review of the new Challenger Hellcat. The video was great as well. I am hoping they won't have a HUGE upcharge for these Challengers.